රැධිර වර්ගය (නොහොත් රැධිර ගණය) නිර්ණය කරනු ලබන්නේ, රතු රුධිර සෛලයන්ගේ පවතින ABO රැධිර ගණ ප්‍රතිදේහජනකයන් විසිනි. රැධිර වර්ගයක්' (වෙනත් ලෙසකින් රැධිර ගණයක්) යනු රතු රුධිර සෛලයන්ගේ (RBCs) පෘෂ්ඨය මත උරුම වු ප්‍රතිදේහජනක ධාතුන්ගේ පැවතීම හෝ නොපැවතීම මත රැධිර වර්ගීකරණයකි. රුධිර ගණ පද්ධතිය මත රදාපවතිමින්, මේ ප්‍රතිදේහජනකයන් ප්‍රෝටීන, කාබෝහයිඩ්රේට, ග්ල්ය්කෝප්‍රෝටීන, හෝ ග්ල්ය්කෝලිපිඩ, විය හැකිය. Some of these antigens are also present on the surface of other types of cells of various tissues. Several of these red blood cell surface antigens can stem from one allele (or very closely linked genes) and collectively form a blood group system. Blood types are inherited and represent contributions from both parents. A total of 32 human blood group systems are now recognized by the International Society of Blood Transfusion (ISBT). The two most important ones are ABO and the RhD antigen; they determine someone's blood type (A, B, AB and O, with + and - denoting RhD status). Many pregnant women carry a fetus with a blood type different from their own, and the mother can form antibodies against fetal RBCs. Sometimes these maternal antibodies are IgG, a small immunoglobulin, which can cross the placenta and cause hemolysis of fetal RBCs, which in turn can lead to hemolytic disease of the newborn called erythroblastosis fetalis, an illness of low fetal blood counts that ranges from mild to severe. Sometimes this is lethal for the fetus; in these cases it is called hydrops fetalis. A complete blood type would describe a full set of 30 substances on the surface of RBCs, and an individual's blood type is one of many possible combinations of blood-group antigens. Across the 30 blood groups, over 600 different blood-group antigens have been found, but many of these are very rare, some being found mainly in certain ethnic groups. Almost always, an individual has the same blood group for life, but very rarely an individual's blood type changes through addition or suppression of an antigen in infection, malignancy, or autoimmune disease. Another more common cause in blood type change is a bone marrow transplant. Bone-marrow transplants are performed for many leukemias and lymphomas, among other diseases. If a person receives bone marrow from someone who is a different ABO type (e.g., a type A patient receives a type O bone marrow), the patient's blood type will eventually convert to the donor's type. Some blood types are associated with inheritance of other diseases; for example, the Kell antigen is sometimes associated with McLeod syndrome. Certain blood types may affect susceptibility to infections, an example being the resistance to specific malaria species seen in individuals lacking the Duffy antigen. The Duffy antigen, presumably as a result of natural selection, is less common in ethnic groups from areas with a high incidence of malaria. 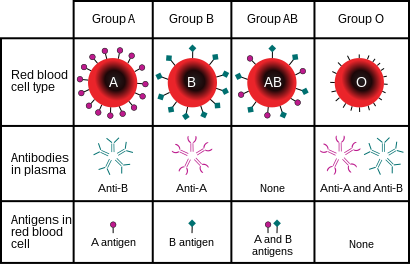 The ABO system is the most important blood-group system in human-blood transfusion. The associated anti-A and anti-B antibodies are usually immunoglobulin M, abbreviated IgM, antibodies. ABO IgM antibodies are produced in the first years of life by sensitization to environmental substances such as food, bacteria, and viruses. The O in ABO is often called 0 (zero, or null) in other languages. The Rh system (Rh meaning Rhesus) is the second most significant blood-group system in human-blood transfusion with currently 50 antigens. The most significant Rh antigen is the D antigen, because it is the most likely to provoke an immune system response of the five main Rh antigens. It is common for D-negative individuals not to have any anti-D IgG or IgM antibodies, because anti-D antibodies are not usually produced by sensitization against environmental substances. However, D-negative individuals can produce IgG anti-D antibodies following a sensitizing event: possibly a fetomaternal transfusion of blood from a fetus in pregnancy or occasionally a blood transfusion with D positive RBCs. Rh disease can develop in these cases. Rh negative blood types are much less common in proportion of Asian populations (0.3%) than they are in White (15%). The presence or absence of the Rh antigens is signified by the + or − sign, so that for example the A− group does not have any of the Rh antigens. As with many other genetic traits, the distribution of ABO and Rh blood groups varies significantly between populations and countries. 32 blood-group systems have been identified, including the ABO and Rh systems. Thus, in addition to the ABO antigens and Rh antigens, many other antigens are expressed on the RBC surface membrane. For example, an individual can be AB, D positive, and at the same time M and N positive (MNS system), K positive (Kell system), Lea or Leb negative (Lewis system), and so on, being positive or negative for each blood group system antigen. Many of the blood group systems were named after the patients in whom the corresponding antibodies were initially encountered. Transfusion medicine is a specialized branch of hematology that is concerned with the study of blood groups, along with the work of a blood bank to provide a transfusion service for blood and other blood products. Across the world, blood products must be prescribed by a medical doctor (licensed physician or surgeon) in a similar way as medicines. 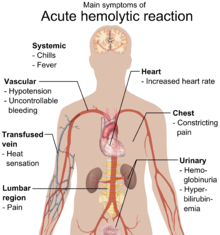 Main symptoms of acute hemolytic reaction due to blood type mismatch. Much of the routine work of a blood bank involves testing blood from both donors and recipients to ensure that every individual recipient is given blood that is compatible and is as safe as possible. If a unit of incompatible blood is transfused between a donor and recipient, a severe acute hemolytic reaction with hemolysis (RBC destruction), renal failure and shock is likely to occur, and death is a possibility. Antibodies can be highly active and can attack RBCs and bind components of the complement system to cause massive hemolysis of the transfused blood. Patients should ideally receive their own blood or type-specific blood products to minimize the chance of a transfusion reaction. Risks can be further reduced by cross-matching blood, but this may be skipped when blood is required for an emergency. Cross-matching involves mixing a sample of the recipient's serum with a sample of the donor's red blood cells and checking if the mixture agglutinates, or forms clumps. If agglutination is not obvious by direct vision, blood bank technicians usually check for agglutination with a microscope. If agglutination occurs, that particular donor's blood cannot be transfused to that particular recipient. In a blood bank it is vital that all blood specimens are correctly identified, so labelling has been standardized using a barcode system known as ISBT 128. The blood group may be included on identification tags or on tattoos worn by military personnel, in case they should need an emergency blood transfusion. Frontline German Waffen-SS had blood group tattoos during World War II. Rare blood types can cause supply problems for blood banks and hospitals. For example Duffy-negative blood occurs much more frequently in people of African origin, and the rarity of this blood type in the rest of the population can result in a shortage of Duffy-negative blood for these patients. Similarly for RhD negative people, there is a risk associated with travelling to parts of the world where supplies of RhD negative blood are rare, particularly East Asia, where blood services may endeavor to encourage Westerners to donate blood. A pregnant woman can make IgG blood group antibodies if her fetus has a blood group antigen that she does not have. This can happen if some of the fetus' blood cells pass into the mother's blood circulation (e.g. a small fetomaternal hemorrhage at the time of childbirth or obstetric intervention), or sometimes after a therapeutic blood transfusion. This can cause Rh disease or other forms of hemolytic disease of the newborn (HDN) in the current pregnancy and/or subsequent pregnancies. If a pregnant woman is known to have anti-D antibodies, the Rh blood type of a fetus can be tested by analysis of fetal DNA in maternal plasma to assess the risk to the fetus of Rh disease. One of the major advances of twentieth century medicine was to prevent this disease by stopping the formation of Anti-D antibodies by D negative mothers with an injectable medication called Rho(D) immune globulin. Antibodies associated with some blood groups can cause severe HDN, others can only cause mild HDN and others are not known to cause HDN. To provide maximum benefit from each blood donation and to extend shelf-life, blood banks fractionate some whole blood into several products. The most common of these products are packed RBCs, plasma, platelets, cryoprecipitate, and fresh frozen plasma (FFP). FFP is quick-frozen to retain the labile clotting factors V and VIII, which are usually administered to patients who have a potentially fatal clotting problem caused by a condition such as advanced liver disease, overdose of anticoagulant, or disseminated intravascular coagulation (DIC). Units of packed red cells are made by removing as much of the plasma as possible from whole blood units. Clotting factors synthesized by modern recombinant methods are now in routine clinical use for hemophilia, as the risks of infection transmission that occur with pooled blood products are avoided. Blood group O (or blood group zero in some countries) individuals do not have either A or B antigens on the surface of their RBCs, and their blood serum contains IgM anti-A and anti-B antibodies against the A and B blood group antigens. Therefore, a group O individual can receive blood only from a group O individual, but can donate blood to individuals of any ABO blood group (i.e., A, B, O or AB). If a patient in a hospital situation were to need a blood transfusion in an emergency, and if the time taken to process the recipient's blood would cause a detrimental delay, O Negative blood can be issued. They are known as universal donors. An Rh D-negative patient who does not have any anti-D antibodies (never being previously sensitized to D-positive RBCs) can receive a transfusion of D-positive blood once, but this would cause sensitization to the D antigen, and a female patient would become at risk for hemolytic disease of the newborn. If a D-negative patient has developed anti-D antibodies, a subsequent exposure to D-positive blood would lead to a potentially dangerous transfusion reaction. Rh D-positive blood should never be given to D-negative women of child bearing age or to patients with D antibodies, so blood banks must conserve Rh-negative blood for these patients. In extreme circumstances, such as for a major bleed when stocks of D-negative blood units are very low at the blood bank, D-positive blood might be given to D-negative females above child-bearing age or to Rh-negative males, providing that they did not have anti-D antibodies, to conserve D-negative blood stock in the blood bank. The converse is not true; Rh D-positive patients do not react to D negative blood. 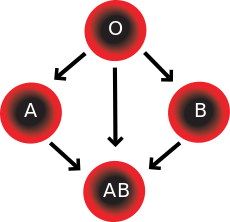 In addition to donating to the same blood group; plasma from type AB can be given to A, B and O; plasma from types A, B and AB can be given to O. Recipients can receive plasma of the same blood group, but otherwise the donor-recipient compatibility for blood plasma is the converse of that of RBCs:[තහවුරු කරන්න] plasma extracted from type AB blood can be transfused to individuals of any blood group; individuals of blood group O can receive plasma from any blood group; and type O plasma can be used only by type O recipients. 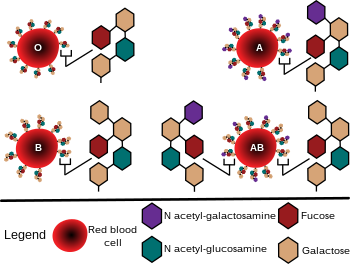 With regard to transfusions of packed red blood cells, individuals with type O Rh D negative blood are often called universal donors, and those with type AB Rh D positive blood are called universal recipients; however, these terms are only generally true with respect to possible reactions of the recipient's anti-A and anti-B antibodies to transfused red blood cells, and also possible sensitization to Rh D antigens. One exception is individuals with hh antigen system (also known as the Bombay phenotype) who can only receive blood safely from other hh donors, because they form antibodies against the H antigen present on all red blood cells. Blood donors with particularly strong anti-A, anti-B or any atypical blood group antibody are excluded from blood donation. The possible reactions of anti-A and anti-B antibodies present in the transfused blood to the recipient's RBCs need not be considered, because a relatively small volume of plasma containing antibodies is transfused. By way of example: considering the transfusion of O Rh D negative blood (universal donor blood) into a recipient of blood group A Rh D positive, an immune reaction between the recipient's anti-B antibodies and the transfused RBCs is not anticipated. However, the relatively small amount of plasma in the transfused blood contains anti-A antibodies, which could react with the A antigens on the surface of the recipients RBCs, but a significant reaction is unlikely because of the dilution factors. Rh D sensitization is not anticipated. Additionally, red blood cell surface antigens other than A, B and Rh D, might cause adverse reactions and sensitization, if they can bind to the corresponding antibodies to generate an immune response. Transfusions are further complicated because platelets and white blood cells (WBCs) have their own systems of surface antigens, and sensitization to platelet or WBC antigens can occur as a result of transfusion. With regard to transfusions of plasma, this situation is reversed. Type O plasma, containing both anti-A and anti-B antibodies, can only be given to O recipients. The antibodies will attack the antigens on any other blood type. Conversely, AB plasma can be given to patients of any ABO blood group due to not containing any anti-A or anti-B antibodies. In addition to the current practice of serologic testing of blood types, the progress in molecular diagnostics allows the increasing use of blood group genotyping. In contrast to serologic tests reporting a direct blood type phenotype, genotyping allows the prediction of a phenotype based on the knowledge of the molecular basis of the currently known antigens. This allows a more detailed determination of the blood type and therefore a better match for transfusion, which can be crucial in particular for patients with needs for many transfusions to prevent allo-immunization. 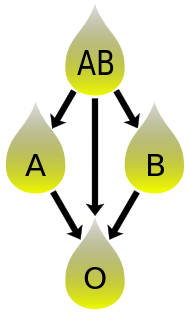 The two most significant blood group systems were discovered by Karl Landsteiner during early experiments with blood transfusion: the ABO group in 1901 and in co-operation with Alexander S. Wiener the Rhesus group in 1937. Development of the Coombs test in 1945, the advent of transfusion medicine, and the understanding of ABO hemolytic disease of the newborn led to discovery of more blood groups, and now 30 human blood group systems are recognized by the International Society of Blood Transfusion (ISBT), and across the 30 blood groups, over 600 different blood group antigens have been found; many of these are very rare or are mainly found in certain ethnic groups. Blood types have been used in forensic science and were formerly used to demonstrate impossibility of paternity (e.g., a type AB man cannot be the father of a type O infant), but both of these uses are being replaced by genetic fingerprinting, which provides greater certainty. A popular belief in Japan is that a person's ABO blood type is predictive of their personality, character, and compatibility with others. This belief is also widespread elsewhere in Asia, notably Taiwan and South Korea. Deriving from ideas of historical scientific racism, the theory reached Japan in a 1927 psychologist's report, and the militarist government of the time commissioned a study aimed at breeding better soldiers. The fad faded in the 1930s due to its lack of scientific basis and ultimately the discovery of DNA in the following decades which it later became clear had a vastly more complex and important role in both heredity generally and personality specifically. No evidence has been found to support the theory by scientists, but it was revived in the 1970s by Masahiko Nomi, a broadcaster with a background in law who had no scientific or medical background. Despite these facts, the myth still persists widely in Japanese popular culture. ↑ 2.0 2.1 2.2 "Table of blood group systems". International Society of Blood Transfusion. October 2008. සම්ප්‍රවේශය 2008-09-12. ↑ 3.0 3.1 E.A. Letsky; I. Leck; J.M. Bowman (2000). "Chapter 12: Rhesus and other haemolytic diseases". Antenatal & neonatal screening (2nd සංස්.). Oxford University Press. ISBN 978-0-19-262826-8. ↑ Dean 2005, The ABO blood group "... A number of illnesses may alter a person's ABO phenotype ..."
↑ "Your blood – a textbook about blood and blood donation" (PDF). p. 63. Archived from the original (PDF) on June 26, 2008. සම්ප්‍රවේශය 2008-07-15. ↑ Talaro, Kathleen P. (2005). Foundations in microbiology (5th සංස්.). New York: McGraw-Hill. පිටු 510–1. ISBN 0-07-111203-0. ↑ Moise KJ (July 2008). "Management of rhesus alloimmunization in pregnancy". Obstetrics and Gynecology. 112 (1): 164–76. PMID 18591322. doi:10.1097/AOG.0b013e31817d453c. ↑ "Rh血型的由來". Hospital.kingnet.com.tw. සම්ප්‍රවේශය 2010-08-01. ↑ Joshua E. Brown (22 February 2012). "Blood Mystery Solved". University Of Vermont. සම්ප්‍රවේශය 11 June 2012. ↑ "Pregnancy – routine anti-D prophylaxis for D-negative women". NICE. May 2002. ↑ "RBC compatibility table". American National Red Cross. December 2006. සම්ප්‍රවේශය 2008-07-15. ↑ Fauci, Anthony S.; Eugene Braunwald, Kurt J. Isselbacher, Jean D. Wilson, Joseph B. Martin, Dennis L. Kasper, Stephen L. Hauser, Dan L. Longo (1998). Harrison's Principals of Internal Medicine. McGraw-Hill. පි. 719. ISBN 0-07-020291-5. ↑ "Universal acceptor and donor groups". Webmd.com. 2008-06-12. සම්ප්‍රවේශය 2010-08-01. ↑ Anstee DJ (2009). "Red cell genotyping and the future of pretransfusion testing". Blood. 114 (2): 248–56. PMID 19411635. doi:10.1182/blood-2008-11-146860. ↑ Avent ND (2009). "Large-scale blood group genotyping: clinical implications". Br J Haematol. 144 (1): 3–13. PMID 19016734. doi:10.1111/j.1365-2141.2008.07285.x. ↑ Landsteiner K, Wiener AS (1940). "An agglutinable factor in human blood recognized by immune sera for rhesus blood". Proc Soc Exp Biol Med. 43: 223–4. ↑ Nuwer, Rachel. "You are what you bleed: In Japan and other east Asian countries some believe blood type dictates personality". Scientific American. සම්ප්‍රවේශය 16 Feb 2011. Dean, Laura (2005). Blood Groups and Red Cell Antigens, a guide to the differences in our blood types that complicate blood transfusions and pregnancy. Bethesda MD: National Center for Biotechnology Information. NBK2261. ISBN 1-932811-05-2. http://www.ncbi.nlm.nih.gov/books/NBK2261/. Mollison PL, Engelfriet CP, Contreras M (1997). Blood Transfusion in Clinical Medicine (10th සංස්.). Oxford UK: Blackwell Science. ISBN 0-86542-881-6. Farr AD (April 1979). "Blood group serology—the first four decades (1900–1939)". Medical History. 23 (2): 215–26. PMC 1082436  . PMID 381816. "Blood Facts – Rare Traits". LifeShare Blood Centers. සම්ප්‍රවේශය September 15, 2006. "Racial and Ethnic Distribution of ABO Blood Types – BloodBook.com, Blood Information for Life". bloodbook.com. සම්ප්‍රවේශය September 15, 2006. "Molecular Genetic Basis of ABO". සම්ප්‍රවේශය July 31, 2008. මේ පිටුව අන්තිමට සැකසුවේ 6 ජනවාරි 2019 දින දී, 15:14 වේලාවෙහිදීය.